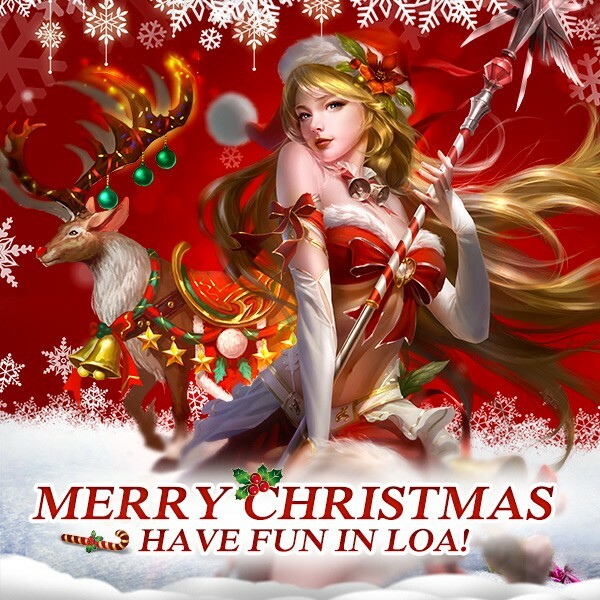 LoA_Let's Enjoy Christmas Holiday in LoA! Christmas is coming! You must have planned quite well for the great festival, and so do us in LoA. Be confused about the new events? Don't worry, come with me to find the secret of Christmas! This is icon of Christmas Holiday. Ready? Click - Let's enjoy the Christmas Holiday! Click the icon of Christmas Holiday, and you will see four parts. 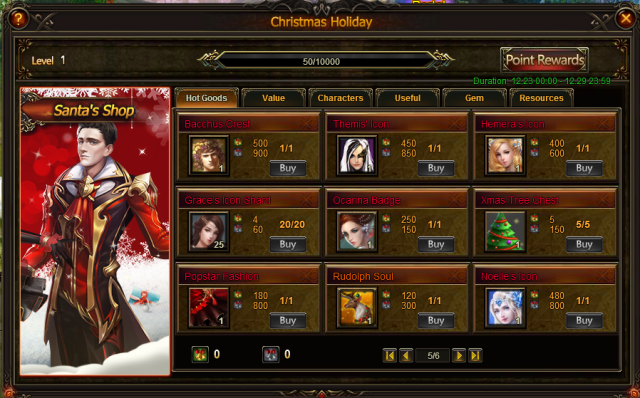 They are Christmas Spirit, World Boss, Christmas Tree, Santa's Shop. Fight together and get great rewards here! Click Christmas Spirit you will see this panel. 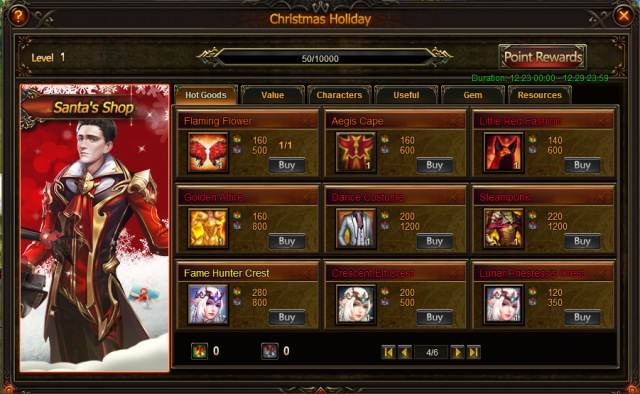 When Christmas Holiday EXP reaches certain amount, all players in this server can collect the rewards. 1. 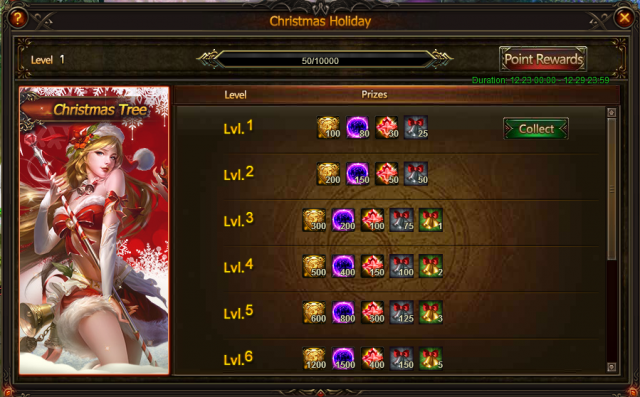 Christmas Holiday consists of 4 parts: Christmas Spirit, World Boss, Christmas Tree, Santa's Shop. 2. Every Silver Bells acquired will earn a player 1 personal point and increase the Christmas Spirit's EXP by 1. Every Gold Bells acquired will earn a player 2 personal points and increase the Christmas Spirit's EXP by 2. 3. 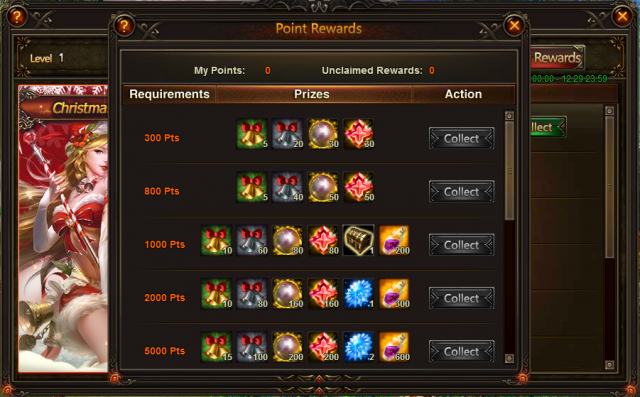 All Christmas Spirit's level rewards can be collected once daily when available. 4. Join the World Boss during the event for a chance to receive Silver bells. Resources, Silver Bells, Gold Bells and more are waiting for you in Gift Boxes! You can randomly get one of the following items with different kind of Corns. Good luck! There are 3 kinds of gift boxes. You need to collect stockings to open them. You can get Empty Stocking, Normal Stocking and Full Stocking through Hot Events or use diamonds to buy. You may ask, how to deal with the candies I have got? OK, here comes a chance for you to exchange great items with Silver Bell and Gold Bell! In Santa's Shop, Christmas Decorations in Homestead will be on sale such as: Reindeer Statue Chest, Xmas Tree Chest; stunning clothing, wings--Popstar Fashion, Dance Costume, Steampunk, Little Red Fashion, Golden Attire, Summer Gear,Flaming Flower, Bat Wings; Powerful hero Lunar Priestess, Crescent Elf, Fame Hunter, Valentina and Fallen Angel, Cedric, Dragon Queen, Dragon Empress; New Angel Noelle, Grace, Claudia, Claudia Awakening Stone, other awesome angels-- Aphrodite, Themis, Hemera; New Sylph Ocarina; Mount Rudolph, Persian Cat, Phoenix, Armored Elephant, Tusky, Armored Rhino, Scarlet Finch, Polar Bear, Inferno Steed; Fairy Golden Hamster, Little Bat, Silver Lord and many more other items, are all available! Description: Recharge certain amount（Total recharge) to get special rewards during Christmas events! You could win each reward only once during the event. Description: Complete following tasks to collect Gold Bells! Description: Get all Bells here! Cheer for Christmas! Description: Reach certain devotion to get items for Christmas! Description: Spend certain these Stones to collect these rewards! Description: Cheers! Enjoy the Christmas! Description: Complete all the tasks to collect more rewards! Description: Merry Christmas! 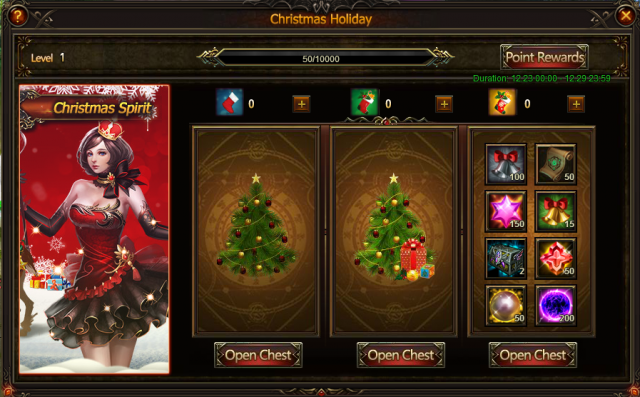 Open the chests in Christmas Holiday to collect these rewards! More exciting events are coming up through Dec 23 to Dec 29(server time), check them out in the in-game Hot Events now! LoA_Craft Master: Stockings Bring You Surprise! LoA_Angel Exclusive: Take your Favorite Angel! LoA_Lucky Tree: Decorate Your Homestead with Claudia Statue! LoA_Cross Server Resources Tycoon: Compete for New Sylph Saintly Queen! LoA_Beach Treasure: Awaken Isolde And Win Poseidon!